After big wins against the Lakers and Memphis this week, could the Rockets on Saturday make us believe they had finally turned the corner on their season and win a game in Chicago against a better team than the Grizzlies on the road in the second game of a back-to-back? But this is the Rockets we’re talking about here. They came within tenths of a second of shaking off their reputation this season for mental weakness in the clutch, but a defensive breakdown that let Derrick Rose hit a wide-open 3-pointer with 0 seconds on the game clock tied the game and sent it to OT, and Houston went on to blow another game they should have won. 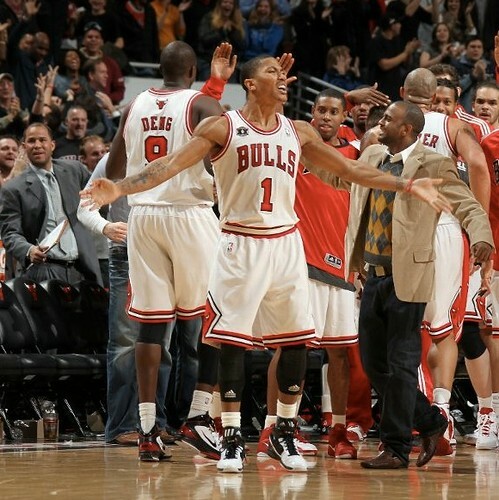 Derrick Rose celebrates after hitting a 3-pointer that tied the game against the Rockets, sending the game into overtime. Click here for more photos from the game. So now we’re back to the problems the Rockets have encountered all season long – play well enough to take leads, but not being able to close the deal. – The Rockets pick-and-roll defense was terrible on Rose. Not just on that buzzer beater that forced the game into overtime, but blowing two other pick-and-rolls involving Rose to let him score. – Brad Miller played a great game in many ways, hitting four 3-pointers and scoring 20 points, but he also was a problem, missing a big free throw (even though he’s an 88% FT shooter this season!) that could have iced the game (same goes for Kyle Lowry missing a FT late), being involved in those pick-and-roll breakdowns, and jacking up a terrible 3-pointer at the buzzer that had no chance when he had plenty of time to pass to an open man. It’s too bad he couldn’t do to the Bulls what he had done to the Rockets last season when he played for Chicago: be the nemesis that would beat them. – I can understand why Luis Scola hasn’t been playing in late-game situations lately with Rick Adelman opting to play Jordan Hill instead. You’ll see in my breakdown why Scola is known for being a liability on the boards and defensively. I’m not sure why Adelman played Scola, and not Hill, late in this game, especially since Adelman said that Hill is the best player who can go get rebounds. And also since Brad Miller was on the court most of the 4th quarter and overtime, and Adelman recently stated he likes playing Miller and Hill together. – Jermaine Taylor got some early action in the second quarter (8 minutes) and had some good moves, scoring on 2-of-5 shots for 4 points. But Adelman didn’t play him the rest of the game, but continued to give Chase Budinger more playing time, and he responded with an 0-for-6 game and 1 point. Ouch. I like Budinger, but he’s having a terrible year (35% shooting, 23% on 3-pointers), and I think it’s way past time to give Taylor more playing time. Maybe that will change up Budinger’s routine or something to knock him out of his funk because he is clearly hurting the team. – Kevin Martin didn’t play at all during the time I started and ended the breakdown (midway through the 4th quarter and through overtime). I understand he was sick, although he did score 14 points in 28 minutes on 5-of-10 shooting – sounds like he was okay to me. They could have really used his free throw shooting instead of Miller’s when the Bulls intentionally fouled him that could have won the game if he had hit both free throws. 6:39 – Courtney Lee hits a 3-pointer. The Rockets pull within two points. It’s 89-87, Bulls. 6:04 – Hill scores on a jump hook over Boozer. Beautiful move and shot. 92-87 Bulls. 5:29 – Budinger misses a 3-pointer and Joakim Noah grabs the rebound, but Lowry steals the ball from Noah! Seven seconds later, Miller nails a three! 94-92 Bulls. 3:39 – Brad Miller drops a nice bounce pass to Lee along the baseline on a backdoor play, Lee lays it in, and he’s fouled! That’s the Adelman offense we’ve always loved! Lee hits the free throw. 98-97, the Rockets take the lead! 3:20 – Lee steals the ball from Rose, who had it over his head after picking up the dribble! 3:06 – Brad Miller hits a three! 101-97 Rockets! 2:52 – Kyle Korver hits a wide-open 3-pointer off a pick-and-roll. Defensive breakdown. 101-100 Bulls. 2:35 – Lowry drives to the basket, misses a layup that’s contested, but Carlos Boozer is called for a loose ball foul against Scola, which is questionable. Scola makes both free throws. 103-100 Rockets. 2:22 – Scola loses Boozer by looking toward the baseline where Rose has dribbled, Roses pass the ball to Boozer, who gets a wide-open look at the elbow for a field goal. 103-102 Houston. 1:59 – Miller drives to the baseline and throws up a little jump hook, but misses. However, Rose is called for a loose ball foul against Lowry. Lowry makes both free throws. 105-102 Rockets. 1:29 – The Rockets play good defense to hold Chicago scoreless on two shot attempts. 1:04 – 24-second shot clock violation on Houston. Miller put up a tough shot that was blocked, but it came after the shot clock went off anyway. 0:56 – Rose drives through the lane, gets to the hole, BUT MISSES A TOUGH LAYUP ATTEMPT! THE ROCKETS COME DOWN WITH THE REBOUND. THE ROCKETS STILL LEAD THE GAME 105-102 WITH LESS THAN A MINUTE LEFT! 0:36.5 – LOWRY DRIVES TO THE BASKET AND MAKES A TOUGH REVERSE LAYUP! THE ROCKETS LEAD 107-102 WITH 36.5 SECONDS REMAINING. THERE’S NO WAY THEY CAN LOSE THIS GAME NOW, RIGHT? 0:24 – Scola allows himself to be easily pushed out from underneath the basket without any resistance by Boozer, and Boozer taps in a missed shot by Noah. 107-104 Rockets. 0:23.6 – Lowry is intentionally fouled by Rose. He misses the first free throw, but makes the second. 108-104 Rockets. 0:14.7 – Scola tried to block a Rose shot in the lane, but that low-percentage block attempt took himself out of the play, which allows Boozer to get inside position and grab the offensive rebound to lay it in. 0:10.7 – Miller missed one of two free throws. 109-106 Rockets. 0:00 – Rose gives the ball to Noah, then cuts back behind Noah’s screen to shake Courtney Lee. Rose rises up and nails a 3-pointer to tie the game. Lee should have fouled Noah by running into him as he was setting the screen. Tie ballgame. 3:33 – Lowry jumps into the air on a Luol Deng pump fake, opening up a lane to the basket that Deng drive through for a layup. 111-109 Bulls. 3:17 – Scola misses a contested layup in the lane. 3:07 – Miller blocks a Rose shot attempt near the rim. Good defense! 2:52 – Miller makes a 3-pointer! 112-111 Rockets. 2:28 – Noah gets a wide open pass in the lane for a layup, and is fouled by Scola on a bad, ticky-tack call by the ref on Scola! Miller came over to help on Rose, who broke down Lee to get into the lane. Scola didn’t help out in putting a body on Noah to keep him from getting wide open. Overall team defense breakdown. Noah misses the free throw. 113-112 Bulls. 2:08 – Scola scores on a nice jump hook in the lane. 114-113 Rockets. 1:49 – Rose gets wide open on a pick-and-roll very close to the same area where he hit his 3-pointer to tie the game. Lee got caught behind the screen, AND ROSE DRAINS A 3-POINTER AGAIN! 116-114 Bulls. 1:32 – Scola hits a jumper at the elbow. Tie game: 116-116. 1:17 – Courtney Lee gets caught behind another pick-and-roll with Noah and Rose, leaving a lane wide open for Rose to drive the lane and score. Miller stayed way out high, which didn’t help any in clogging the lane. The pick-and-roll defense on Rose has been terrible. 118-116 Bulls. 0:26 – Rose misses a jumper. Good one-on-one defense by Lee to contest the shot. 0:08 – Miller barely misses a wide open 3-pointer that could have given the Rockets the lead. 0:04.5 – Ronnie Brewer is fouled on a loose ball to stop the clock. Brewer makes only 1-of-2 free throws. 119-116 Bulls. The Rockets have a chance to tie it. 0:02 – Miller received the inbounds pass and put up a very low-percentage shot with 2 seconds remaining on the clock, which is still plenty of time to pass the ball to an open man. The shot falls way short. Game over. Meanwhile, Lowry was wide open behind the 3-point line Miller should have tried to pass the ball to. Rockets lose 119-116. I watched the WGN broadcast of the game, and I’ve never seen a broadcast crew (that includes former Bull Stacey King) whine so much about a foul that didn’t happen. When Derrick Rose drove to the basket and missed it with 56 seconds remaining in the 4th quarter, they slowed down the replay and said Rose was fouled 3 different times on that one drive AND NONE OF IT WAS TRUE! THEY WERE MAKING UP FOULS THAT DIDN’T HAPPEN, and then continued to whine about it for a couple of minutes during a timeout. Give me a break! After winning two of their last 3 games and righting the ship somewhat, on Tuesday the Rockets went back to their old ways and blew another 4th quarter lead. Holding an 8-point advantage at the start of the 4th quarter after scoring the last 10 points of the 3rd, the Rockets were victimized by Chicago’s Derrick Rose, who scored 16 points in the 4th quarter and keyed the Bulls to 18 unanswered points in that final period, sinking the Rockets to a 3-7 record. During that critical 4th quarter stretch, the Rockets had 8 turnovers in a little over 9 minutes. In other words, they fell apart…again. Although Kevin Martin has stepped up in most games this season, there’s not much margin for error if he doesn’t do it with Yao Ming, Aaron Brooks and Chase Budinger out with ankle sprains. Martin had a rare off-night, hitting only 5-of-15 shots for 18 points. Meanwhile, Rose scored 33 points on 13-of-20 shooting. The NBA is a game where point guards have a huge advantage if they have the skills to exploit defenses given the rules that reward them for getting past their man and into the lane. If they can hit the 3 on top of that, look out. Rose isn’t that great of a 3-point shooter, but he was Tuesday night, hitting 4-of-5 from behind the arc. With Aaron Brooks out and Kyle Lowry (7 points) and Ish Smith (0 points) not that great of shooters, they were going to need production from their bench. They only got 8 points, whereas Chicago had 29. Courtney Lee was 0-for-1 and had four turnovers in just 13 ½ minutes. I like Lee a lot, but I think it’s about time the Rockets gave Jermaine Taylor more of a chance while Budinger, Brooks and Yao are out. The guy was the 3rd leading scorer in the NCAA his senior year, averaging 26.2 ppg. Why not use him when desperate times call for desperate measures? We’ve seen what the guy can do to light it up. He reminds me a little bit of Von Wafer in how he can score points in bunches with his athleticism. Taylor also reminds me a little bit of the Lakers’ Shannon Brown, who never really got a chance with several NBA teams. But when thrown into a deal to the Lakers as an afterthought, Brown has flourished as seen by how he torched the Rockets in Game 1 with all those 3-pointers in the fourth quarter. And Brown got his chance playing in the shadow of one of the best players ever — Kobe Bryant! If the Lakers can give a guy a chance to prove himself behind Kobe, you’d think the Rockets could do the same behind their shooting guard. If the Rockets are going to draft big-time scorers, then you’d expect they would use them when they have problems scoring points in a game like this one. I kind of get tired of hearing about how a player may not “be ready” defensively. Right now, beggars can’t be choosers. Play Taylor and see what he can do to help the bench. Who knows, you may end up wondering why it wasn’t done sooner. There are countless other examples of teams who gave bench warmers an opportunity to contribute when they have struggled, and it worked out beautifully for them. Hasn’t the name ‘Arian Foster‘ taught professional teams to give backups more chances to shine? One area where Taylor can help is shooting the three. On Tuesday night, the Bulls had a 9-point advantage from behind the arc, hitting 67% of their 3-pointers compared to the Rockets’ 33%. Rose’s 4 treys were daggers. The Rockets got out-rebounded by the Bulls 40-32, meaning Yao’s absence hurt, although Brad Miller filled in admirably with 21 points on 8-of-15 shooting, and 5 boards. But when none of your players come up with more than 5 rebounds, that’s not good. Chicago’s small forward, Luol Deng, had 10 boards. Shane Battier had 5. The Rockets had a golden opportunity to win since the Bulls only made 54% of their free throws (15-of-28), but couldn’t capitalize on such a rare night when they shot so poorly from the charity strip. Tonight the Rockets face an explosive Oklahoma City team. We all know they’re going to need to play defense to have a chance in this one, but also score a bunch of points to keep up with Kevin Durant and Russell Westbrook. I think it’s “Taylor time” to see if he can shine. For 6 consecutive games the Rockets had found a way to evolve from their charitable ways—meaning they stopped giving away games in the 4th quarter. That streak is no more with a souring 105-102 defeat to the Chicago Bulls. For 43 minutes the Rockets played dominant basketball and built as much as a 17 point lead with less than 6:00 minutes left in the game. But they never actually kept the Bulls from doing what they wanted to on offense; the Rockets were just somehow able to keep outscoring Chicago. It seemed like every time the Bulls made a run, the Rockets would follow up with a better one. Until that is, they stopped scoring the ball altogether. in Chicago. But it wouldn’t be enough in a heartbreaking loss. The last 5:00 minutes of this game should be a reminder to all of us fans that Houston is not that good. Artest was hot from the perimeter all game but he let it negatively alter his game in the long run by eschewing his Bogart ability on the drive and in the low post. He forgot he needed to get it done from the free throw line—the exact thing Houston had used to their advantage in their crunch time wins. After the Bulls whittled the Rockets lead down to 12 late in the game, Houston put Yao back in the game only to not give him a single touch in the low post in the final 5:00 minutes. Traditionally, with a lead down the stretch, you win the game at the line but you can’t get there if you can’t get the ball in the low post. Yes, the Bulls did a great job of fronting Yao and playing a man behind him to discourage the lob but Houston gave up on Yao way to early in the possession, which is where Aaron Brooks comes in. You knew it was going to be a good night for Yao and the Rockets when Yao started off his game against Chicago by blocking 2 shots in the Bulls’ first two possessions. 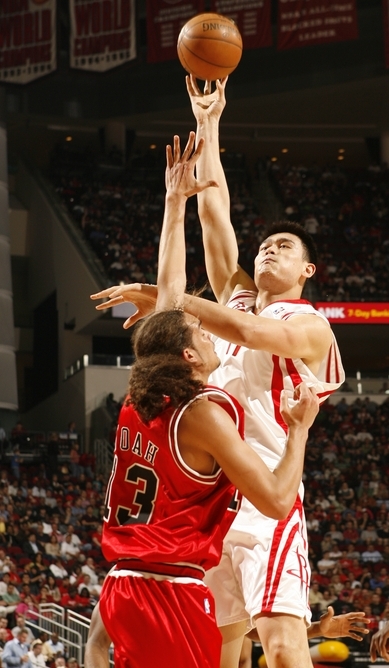 Then 2 minutes into the game, Yao was able to send Joakim Noah to the bench with his 2nd foul. But Yao would get into foul trouble himself by picking up his second foul with 7:06 in the first quarter, and went to the bench because of a gash he suffered on his arm during that play. Saddled with foul trouble, Yao had 11 points in the first half, and really got it going in the fourth quarter with 11 more points, scoring 9 points during a 4 1/2 minute stretch that gave the Rockets the cushion they needed to squeeze out a 107-100 win. Yao would finish with 28 points on an outstanding 9-of-12 shooting from the field and 10-of-10 from the line. He would also grab 8 boards and 4 blocks. And he fouled out Noah in just 18 minutes, leaving the pony-tailed one with only 2 points and 1 rebound. Yao pretty much dominated. Yao Ming shoots a hook shot over Tyrus Thomas on his way to 28 points. “They don’t have any guy that really matches up against us inside. They always come with those double teams. They always come with those smalls. I just work on my game. I have the confidence. It’s very simple. When I came back into the game, it’s the fourth quarter. We know how important it is. We did this a lot before, early in this game, early in this season. I just want to have the ball deep and draw the defense, the double team and see if I can do something in there or kick it out. Yao Ming shoots a jump hook over Chicago rookie Joakim Noah on Sunday night to help the Rockets win their 12th game in a row, beating the Bulls 110-97. Yao’s firepower wasn’t needed as much since 6 other Rocket players scored in double figures. Yao would finish with 12 points and 6 boards. Click here for more photos from the game. Click here for photos from the team practice, press conference with Bobby Jackson and Gerald Green, and the pre-game shootaround. When the Rockets were only leading 49-46 at halftime against a Chicago team that had young players in the starting lineup like Joakim Noah, Tyrus Thomas, and Thabo Sefolosha, and brand new veterans like Drew Gooden and Larry Hughes, the thought of the Rockets finally running out of gas after 11 straight wins had to enter one’s mind. The Bulls were intent to make the Rockets run, and it was an effective strategy. The Rockets were playing well on the offensive end of the court, shooting 50% and scoring 49 points. But their defense gave up 53% shooting in the first half, 13 fast break points, and it didn’t help that the Rockets missed 7-of-14 free throws. In the third quarter when the Rockets got close to putting the game away, the Bulls continued to fight and only trailed by 9 points entering the fourth quarter. Was this going to be another Philadelphia game debacle where the Rockets blow a fourth quarter lead to a young team that didn’t have much to lose? Maybe the team from a couple of months ago might implode, but not this Rockets team that seems like a completely different crew playing with a new mindset. In the fourth quarter, the Rockets hit a barrage of 3-pointers that was “vintage Spurs” to blow the Bulls out in the final few minutes. In that pivotal fourth quarter, new backup point guard Bobby Jackson quickly made his presence felt to make those fans who miss Bonzi Wells not feel as bad about his departure. Jackson hit a tough, leaning jumper (when’s the last time Mike James did that?) to make it 81-72, then on the next possession he took it all the way to the rack from the 3-point line for a twisting layup, and was fouled! After BJ hit the penalty free throw, the Rockets led 84-74 with 9:36 remaining. 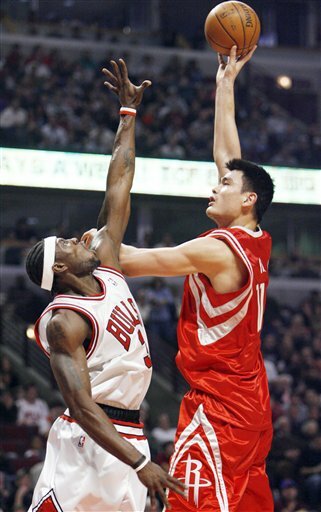 Yao Ming shoots a jump hook over Chicago’ Ben Wallace in a game the Rockets won handily, 116-98. Yao scored 18 points and grabbed 8 boards in a game where he sprained his thumb, but x-rays were negative, and Yao would come back into the after the injury to play for a few minutes with a bandage on his thumb. Click here for more photos from the game. You’ve got to give credit to the Rockets for bouncing back from that heart-breaking 2OT loss against the Denver Nuggets Thursday night, and playing better offense Saturday night in a big 116-98 win over the Bulls. It was the most points scored by the Rockets all season, and had to be one of their best shooting games (48.4%) while also shooting 10-of-22 from three-point land (46%). It looks like Rick Idle-man has finally learned — a couple of weeks later than what many of us have been saying — that he’s had a stud point guard on the bench in Aaron Brooks who can likely solve some of the offensive problems that have plagued them all season. At least Idle-man is learning, folks. Better late than never. Brooks continued to show his speed is extremely tough to defend, as seen when he went coast-to-coast on a highlight-reel layup in the second quarter that reminded you of a Tony Parker. Even though it doesn’t surprise me, IT LOOKS LIKE THE ROCKETS CHRISTMAS WISH OF GETTING A POINT GUARD THAT CAN SCARE THE DEFENSE HAS COME TRUE!! Kudos go out to Rockets’ GM Daryl Morey and the rest of the staff who wanted Brooks, when just about everyone was saying they should have drafted a power forward with their first pick in the draft. Their selection is starting to pay off in a big way. Brooks pushed the ball most of the time he got the ball, which encouraged his teammates to hustle to get into position so he could deliver the rock to them for some easy buckets. And that he did. In a little over 17 minutes, Brooks dished 6 dimes and only had 1 turnover. He also made 2-of-5 shots, but that’s not as important as the decision-making he showed in not trying to wow us with his 3-point shooting acumen (which he has), and just played good solid PG play, unlike some other guards have been doing this season, tempted by the glory of hitting the three when they have no business shooting them. It was another pathetic game on Monday night with the Rockets. They were stinking up the place with poor shooting. Rafer Alston missed his first 10 shots, the Rockets had made only 13-of-43 shots (30%) in the first half, missed 14 three-pointers in a row, and had only 30 points to show for it, a season-low. Luckily Chicago wasn’t shooting much better, scoring only 40 points by halftime. But with 50% team shooting in the third quarter, Tracy McGrady bounced back from a 3-of-10 first half, put the team on his back and scored 25 points in the second half to pull out an improbable win, 84-77. Ben Gordon was schooling the Rockets in the fourth, and if it hadn’t been for Van Gundy putting Shane Battier on Gprdon defensively instead of Alston, the Bulls would have won this game. The Rockets couldn’t stop Gordon. But after Battier was assigned to him late in the fourth, Shane came up big with two stops late in the game. T-Mac’s performance was nothing short of remarkable. It’s like when the game gets serious in the second half, and especially the fourth quarter, he rises to the occasion, keeps you in the game, and gives you a great chance to win it. He almost was able to do that on Sunday against Minnesota. On Monday, his hitting two three-pointers in a row to make it 63-55 was the separation the Rockets were looking for, and down the stretch he made big shots to win it. On the flipside, Alston’s 2-of-14 shooting is astounding. I’ve never seen a guy miss so many layups and shots around the basket as this guy. Before the game, Van Gundy was adamant that for the time being, Alston is their guy and nothing is going to happen to replace him. But I’ve got to think that stance can only last so long as Alston continues to miss easy shots. The Rockets won Monday night in spite of him. Ben Wallace goes after one of Yao’s shots Thursday night. Yao scored 20 points on 7-of-19 shooting and grabbed 12 boards in a 101-100 win over the Chicago Bulls.” Click here for the game story. For more photos from the game, click here. Okay, so the Rockets lost another big lead last night to the Bulls. I’m not too concerned. They still won. Before they lost their 21-point third quarter lead, the Rockets were probably playing a little above their heads. For example, the Rockets came out shooting extremely hot in the third quarter, hitting 9 of their first 10 shots. For them to keep up that kind of shooting percentage is not realistic. Furthermore, the Bulls are no slouch of a team, and they were probably playing below their capability when they fell behind so much. In the long run, the hot and cold streaks tend to even out for both teams, and the better team will usually win, which I believe the Rockets were. And the final score of 101-100 made the game look closer than what it really was, with Andres Nocioni hitting a three-pointer with no time left. Sure, the Rockets made some mistakes, but they will learn from them, even if the same mistakes and turnovers have been a common occurrence lately. But I would rather have those mistakes happen now than later in the season or the playoffs. They need something to work on over the next 73 games, right? If they didn’t, the games would be kind of boring to watch, don’t you think? Surprisingly, even Jeff Van Gundy is not being as doom-and-gloom as he normally is, even after wins. One of those good things was the Rockets hitting their free throws down the stretch, hitting 9 of 10 free throws to finish the game. That was pretty clutch and is something the Rockets are not known to do well as a team. Yao had a rough first half, hitting only 3-of-10 shots, but still had scored 10 points and grabbed 9 boards at the half. Ben Wallace got props from Bulls coach Scott Skiles for playing the best defense he had seen played against Yao. Yao made 4-of-9 shots in the second half and finished with 20 points and 12 rebounds. He also finished with only two turnovers. The Rockets showed some resilience in the first half, turning an 8-point deficit in the first quarter into an 11-point halftime lead, thanks to Scott Padgett scoring 11 points on 4-of-7 shooting. I had mentioned the other day the Rockets were smart in signing Padgett again since he was their best 3-point shooter two seasons ago before letting him go. The Rockets extended the lead to 21 points in the third quarter before Ben Gordon got hot and got the Bulls back into the game. I like the intelligence Padgett showed after the game in analyzing the Rockets second half collapses. T-Mac had a sensational boxscore and showed signs that he may be breaking out of his slump, hitting 8-of-17 shots, scoring 21 points, grabbing 11 boards and doling out 7 assists. Before closing, I had to mention one note about the TNT coverage. Analyst Doug Collins was surprised the Rockets were pushing the ball on fast breaks, saying the Rockets are not a running team. Well, if he did his homework, he’ll see that Van Gundy has emphasized running when the opportunity is there since he has the horses, like McGrady and Luther Head. They also have added Kirk Snyder (who was running on one of those breaks Thursday night), who is much quicker than the recently departed David Wesley and Jon Barry. Do your homework, Doug. Tracy McGrady reacts vigorously after hitting a big 3-pointer in double-overtime that was the game winner in Chicago Friday night. SATURDAY, 1/21/06 – I just got through watching a recording of last night’s game of the Rockets’ win over the Chicago Bulls in double overtime. It’s amazing to me how T-Mac can come off the inactive list from his back spasm problem, play the number of minutes he played (40) and rack up the numbers he did: 35 points, 9 rebounds and 6 assists. He was originally scheduled to only play 28 minutes so he could ease himself and his back into action, but that strategy flew out the window once the Rockets had a chance to win it. The Rockets were down 86-80 with 3:56 remaining in the fourth quarter, but for once, they were able to come back in the clutch. They went on an 8-2 run and tied it at 88-88, capped by Juwan Howard scoring his 29th and 30th points of the game. Without Juwan kicking in his 30 points on 15-of-29 shooting (20 in the second half), the Rockets would not have had a chance in this game. The Bulls went up 90-88 when Luol Deng hit a jump shot with 46 seconds remaining. But then an unlikely Rocket hero came up big. Chuck Hayes, playing only his second game in the NBA, got a huge block of Kirk Hinrich near the basket. Hayes secured the ball, called time-out, which set the Rockets up for a huge chance to tie the game and put it in overtime. On the ensuing Rocket possession, T-Mac missed a long two-pointer, but grabbed the rebound and sank a cold-blooded, fadeaway baseline jumper to tie it up 90-90 with 2.1 seconds remaining. The game went into overtime where T-Mac scored six points, then into a second overtime where T-Mac scored 7 more points. In that second OT, T-Mac missed a shot with 1:05 remaining that could have put the Rockets up 108-106, but Hayes came up big again with another rebound, setting up a play were T-Mac hit a 3-pointer with 42 seconds remaining to give the Rockets a 109-106 lead. Playing some good defense down the stretch, the Rockets held on for the 109-108 win. More about Hayes, though. Just two games out of the NBA Development League, the dude scored 12 points, grabbed 13 boards and had two blocks in 32 minutes of play. The Rockets were high on Hayes back in the pre-season, but he just missed making the final roster. But since the Rockets have been decimated by injury, they brought him back and signed him on Wednesday to a 10-day contract. Hayes was racking up good stats in the D-League, averaging 11.6 points per game for the Albuquerque Thunderbirds, and leading that league with 12.2 rebounds per game. Hayes played at Kentucky and had a pretty good career there, tying a school record by starting 110 consecutive games. In his senior year, he was named consensus First-Team All-SEC and the league’s Defensive Player of the Year. So the guy is no slouch. The knock against Hayes’ prospects in the NBA is his relatively short 6′-6″ height to play power forward, and his limited ball-handling skills to play small forward. But on Friday night against the Bulls, he showed that his height was not a detriment in coming up with big rebounds, blocks and points in the paint. If he continues to play like this, he’s going to find himself a permanent roster spot on the Rockets and give Stromile Swift some competition at power forward. But I don’t want to get excited too early. One game does not make a career, and the Bulls (16-23) haven’t been much better than the Rockets (now 13-25). Unfortunately, Houston has to play a juggernaut Detroit Pistons team (league-leading 32-5 record) on Sunday afternoon. No matter how well T-Mac, Howard and Hayes play, that game will definintely be a loss for the Rockets. FRIDAY, 1/20/06 – I was pretty tired last night and had to go to bed before the Rockets game ended. Wouldn’t you know it…they ended up winning for once! T-Mac returned to score 35 points in a double-overtime win against Chicago, 109-108. And Juwan Howard scored a season-high 30 points! Yippee! The Rockets 7-game losing streak is over! I’m definitely going to watch my recording of this game, and will provide a report later on Saturday. You are currently browsing the archives for the vs. Chicago category.